I'm not the only one enamored with the Prairie look. 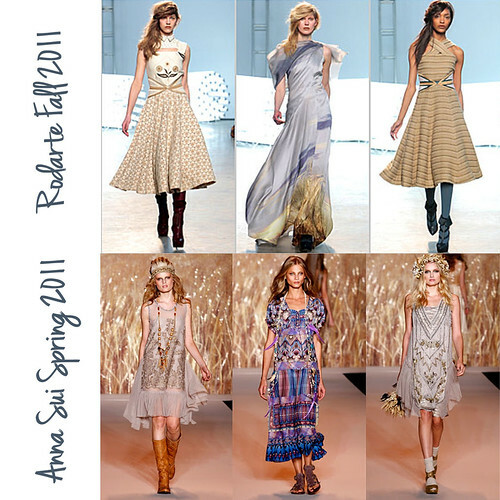 Look what came off the Ready-To-Wear runways this past year. 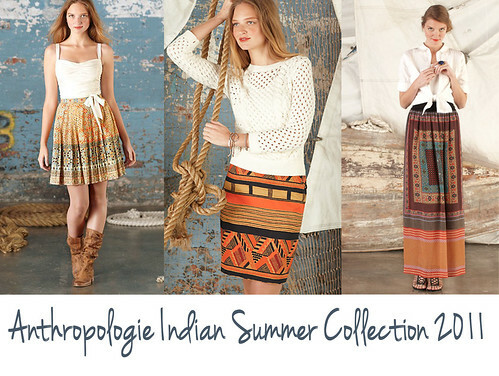 Anthropologie also had some Prairie-Inspired looks in their Indian Summer collection. I think this look will transition seamlessly into fall, and it's especially easy to add a subtle Prairie-influence to your style for work or for weekend. I have built these collections around easy to find, moderately priced pieces that are on-trend and readily available at most clothing retailers. Featuring the "Silk and Stones" Bracelet, and "Copper Leaves" Earrings, this ensemble pairs skinny jeans with a loosely draped poncho sweater. Accessorize with wedge lace-up boots, a wide brim hat, slouchy brown leather bag and oversized shades. Perfect for a Fall Day! Winter-White Cords, a fitted Chambray Oxford, comfortable Tan Loafers, a knit Gold Cardigan, and chic Red Leather structured Tote are complimented by the artisinal accents of the "Heart Canyon" necklace and "Copper Spirals" bracelet. About town or at the office, this outfit is comfortable and stylish. Easy, Romantic and Bohemian. A flowing Maxi-Skirt in an Neutral Ethnic print is topped with a simple coordinating Solid Scoop-Neck Tee and Gauzy Belted Cardigan. Accessorize with a Statement Piece, like the "Irreverent Willows" necklace and coordinating "Sweet Clusters" earrings, Peep-Toe Wedges and a Leather Cross-Body Bag. Erin, I just LOVE the way you are featuring your designs. I found Polyvore because of you (now to learn how to use it)! Your work looks wonderful with up-to-the-minute fashion! Fantastic! Georgene, that is wonderful! There is a million things you can do with Polyvore- have fun! Thank you so much for your encouragement- I am glad you are enjoying these! Love,love, love this!!! These look awesome my friend!!! Love what you did even better then the runway lol!